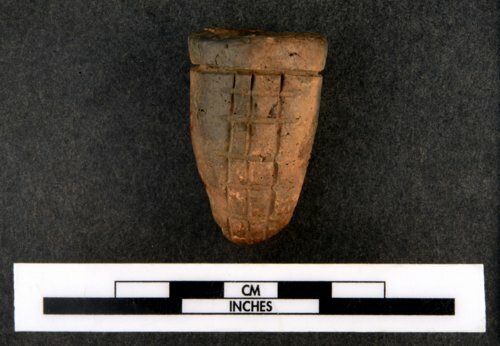 This ceramic (clay) pipe was commonly manufactured by Plains and Eastern Native Americans in North America. This one was found in Leavenworth County. These pipes were used for smoking tobacco and were introduced and traded to Europeans during the American Colonial period. Early European trade pipes were modeled on the Native American designs. The bowls were often decorated with intricate lines and patterns below the rim and on the body.